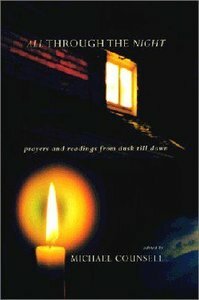 - Publisher "All Through the Night" is a unique and attractive prayer book, divided into prayers and readings for different times of day. Contributors range from Martin Luther and Julian of Norwich to William Shakespeare and John Keats. It also contains many Scripture readings. Nighttime signifies many things. Apart from the rest and refreshment that sleep brings, the night can be a time for gazing at the stars, dreaming, and loving. For most people, there are occasions when the night brings no relief--when we are worried or afraid, trouble never looms larger than in the early sleepless hours. Yet such times also can lead to a richer experience of meditation and contemplation. These experiences of the night are universal and have inspired poetry, prayers, lullabies, songs, and stories down the ages. This wide-ranging collection is the perfect bedside companion and will help soothe us to sleep, dispel nighttime fears, and attune us to the gifts and opportunities that each new day brings. About "All Through the Night"
"All Through the Night" is a unique and attractive prayer book, divided into prayers and readings for different times of day. Contributors range from Martin Luther and Julian of Norwich to William Shakespeare and John Keats. It also contains many Scripture readings.